Hear Ye, Hear Ye: Please Share Your Mobile Instructional Tips! Up until today, our blog posts have been our reflections (aka rants, diatribes, biased reports) about various educational and technological issues — from calling Bill Gates out for saying something stupid to predicting classroom penetration of mobile devices in 2015, from decrying certain Common Core technology standards to using WeMap and WeKWL, collabrified concept mapping and collabrified KWL charting on iOS and Android mobile devices. We have created blogs focused on specific topics, e.g., “In Defense of Teachers” where we take the side of teachers (for a change) and more recently the “Tech Fanboy Corner,” where we revel in the details of new technologies. And with this blog post, we are kicking off yet another focused blog: “Teacher Tips for Mobile Technology.” In this blog, we will describe concrete instructional techniques that take advantage of mobile devices and that have been classroom tested. Teachers are busy; given the time they can and do invent curricular uses for mobile devices. But time is very precious — and lately it feels, time is getting even more precious. So, with the goal of making classroom teachers’ jobs a bit easier, we will be provide descriptions of specific instructional techniques that focus on using mobile devices, from smartphones to tablets, from iOS to Windows Phone 8 — with Android in between. And we know that fourth-grade teachers will pass over techniques directed towards 11th graders and that science teachers will pass over techniques directed towards English teachers. OOOOPS! Not so fast! The Common Core Science Standards are pushing science teachers to now be more responsible for teaching literacy skills, and Common Core English Standards are pushing English teachers to be more responsible for teaching how to use evidence in arguments. The more we read about the Common Core State Standards (and the Next-Generation Science Standards) the more we realize how big a change is in the wind! Enough on CC and NGSS for this blog; but we will be back with a “reflection” — for sure! Back to Teacher Tips for Mobile Technology.... While we have been and continue to be involved in K-12 classrooms where mobile devices are used on a daily basis, and while we can — and occasionally will — include a tip for mobile tech use, we are asking YOU, our blog-reading teachers, to write in with a technology tip for mobile technology use. From “I am busy enough, I don’t have the time to write up a technique“ to “Everyone already uses this technique, so why should I bother” there are many good reasons why you can’t send us a technique. But all those good reasons notwithstanding, please, take 15 minutes and write up a paragraph describing your mobile tip. Include an example document; include a picture; send along a video. We will publish YOUR tip! To kick off the teacher tips section, here is an instructional activity that we have observed in elementary classrooms. 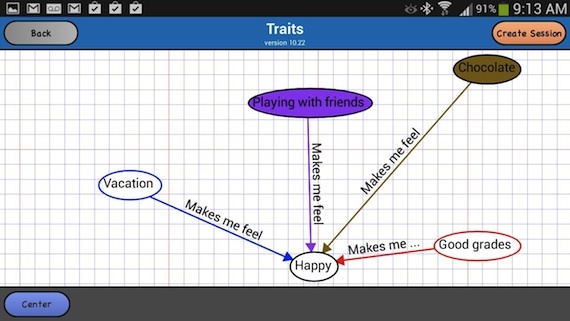 Mobile Technology Used: Concept mapping on a mobile device; but it can be best done using WeMap — a collaborative concept mapping tool on an iPad or on an Android device. Educational Goal: Help elementary school children Increase vocabulary about the traits of characters they read about. Put three students in each group. Teacher puts a trait about a character they have been reading about on the board, e.g., happy, brave, lonely. Each student in each group creates a node with the teacher provided word, and then the group brainstorms actions that illustrate the word. A new node is created, by each student, for each of the contributions from the group. Then, each student creates a complete sentence using the synonym and enters it into the notes field of the node. With WeMap (see image, below), when one student enters a node, that node immediately appears in the concept maps of the other students in the team – saving the time of each student adding to their concept map and perhaps even making a mistake. And, each student can see the sentence that each of the others entered into the notes area of a node immediately upon entry. WeMap is a collaborative concept mapping tool for iOS and Android. Click for larger image.